Das Bundesministerium für Ernährung und Landwirtschaft veranstaltet seit über 50 Jahren im zweijährigen Rhythmus das Internationale Seminar für Führungskräfte der Landjugendarbeit. Das Internationale Seminar richtet sich weltweit an Führungskräfte und Multiplikatoren in verantwortlichen Positionen der Jugendarbeit oder Berufsbildung im ländlichen Raum. Der in den 1950iger Jahren geäußerte Wunsch vieler europäischer Landjugendführungskräfte, ein ständiges Bildungs-Zentrum für den gegenseitigen Erfahrungs- und Gedankenaustausch aufzubauen, führte bei einem Treffen von Vertretern der FAO (Ernährungs- und Landwirtschaftsorganisation der UN), der UNESCO (Organisation der UN für Erziehung, Wissenschaft und Kultur) und der WAY (World Assembly of Youth) am 22. Juli 1960 in Paris dazu, dass die Bundesrepublik Deutschland sich bereit erklärte, ein Internationales Seminar für Landjugendarbeit einzurichten. Führungskräfte aus aller Welt sollten so vielfältige Unterstützung und Anregungen für eine Weiterentwicklung und Stärkung der Landjugendarbeit in ihren Ländern erhalten. 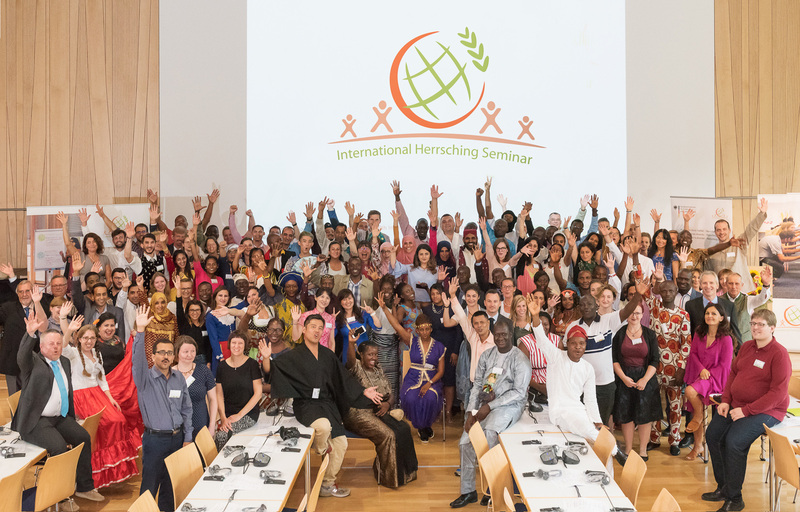 Seit der ersten Veranstaltung 1962 wurden alle 28 Internationalen Seminare im Haus der bayerischen Landwirtschaft in Herrsching am Ammersee durchgeführt. Fast 1900 Teilnehmerinnen und Teilnehmer aus rund 150 Nationen nutzten bisher die Chance für Begegnungen und Austausch. Wertvolle Impulse und konkrete Projektideen zur Verbesserung der Landjugendarbeit wurden in den vergangenen Jahrzehnten weltweit in die Praxis umgesetzt. In den Landjugendbewegungen aller Kontinente hat dieses in der Welt einmalige Seminar einen ausgezeichneten Ruf. Bisher haben rund 1.900 Teilnehmerinnen und Teilnehmer aus 154 Ländern die Chance auf eine berufliche Qualifizierung und den wertvollen interkulturellen Austausch genutzt. Inspiration durch Vielfalt – Herrsching wirkt! Inspiration from diversity – Herrsching works! I hadn't expected before to attend such an international workshop. So at first, I was nervous but as days went on I liked it so much that I didn’t want it to end. I really enjoyed it and the skills and knowledge I gained from it. I have had many experiences so far and have been studying. However, this workshop was more exciting than any experience so far and I was able to learn through many encounters and the respect each side gave to the other, I understood my own subjectivity, leadership and cooperation. In an international network, words are really important. Especially for those who aim at becoming rural leaders. Using precise words and deepening understanding together is really important. I strongly learned that one skill is to understand by listening to people's stories and that this skill is different from talking about my thoughts. But, I also learned to supplement my language skills by making reliable relationships via improved communication skills using the various methods that were taught in this workshopBy learning and spending time with people from all over the world, I learned the importance of communication, my ability, and what I need to learn. I would like to study more in the future so that we can meet everyone on the international stage as rural leaders again. Thanks for everything; you gave me many opportunities to learn. Working in a group with different cultures as well as different personalities is exactly what the Seminar is about: "Inspiration from Diversity!" Even if it was challenging sometimes, we have seen that with communication and collaboration: Everything is possible and we can get the result. Regarding leadership skills, knowing my capabilities is another feedback of the Seminar, as we all have the chance to express ourselves at the same level. For my personal interest, I also learned different techniques of presentations; like role playing and pecha kucha and I know better now how to enrich my presentations. And the best thing about the Seminar is having all these experiences in a very comfortable environment where everybody feels at ease and makes others feel at ease too. As a final remark, I would like to mention that networking is one my expectations before the Seminar and now, I believe that I have a huge family around the globe. The seminar is a worthwhile once in a lifetime opportunity, which is structured in a way that prepared us physically, through the well-timed excursions and mentally through the presentations and class activities. Personally, I felt empowered because the seminar constitutes an excellent foundation for good leadership and interpersonal cooperation which are keys to the development of communities. As a person who was born and raised in a conflict zone, I must say, I do believe in peace and I am eagerly willing to work for it. In Herrsching I saw peace, I felt it and I lived it for two weeks with hundred people coming from different countries. Politics, race, religion and other meaningless ideologies did not make any sense when we joined together to build our teams, when we shared Bavarian food, when we clapped to Russian songs or danced Taiwanese dance. Herrsching indeed works! I suggest to make this kind of seminars for politicians - maybe they will find a way to get inspired by diversity.